Oops - we don't appear to have a video for the GT-S50. Have had this scanner for about a year. 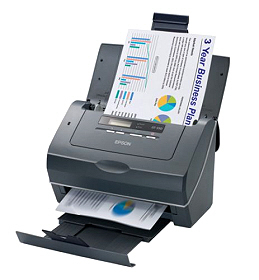 We have scanned many thousands of pages, in duplex and single sided mode. It works exceptionally well and we've had no significant problems with it. It does miss a page once in a while though by double feeding which can be a nuisance because you do need to glance through to check you have the same number of pages you expected in large documents. I think there are scanners with ultrasonic monitoring to help prevent this, but for the price I am very happy with this device. Easy to use and set up. Would happily buy again if needed and from Trade Scanners given the excellent price.